The new Origin EON17-X comes packed with desktop parts. Moreover, this new notebook is like a monster in the benchmarks. This is just like a gift for hardworking and gamer customers. Without a doubt that there will come a time when people will stop referring to machines like this one as “notebooks” and start calling them ultra-compact desktops with built-in displays. Of course, these machines will still be very easy to move from one place to another, but aside from the form factor, we must say that these devices are desktop-class from top to bottom. Manufacturers that are making high-end gaming PCs have started to build their notebooks with desktop CPUs, but the best thing is that Nvidia’s Pascal mobile parts are essentially the same as their desktop counterparts. So, yes, this is the main reason why machines like the new Origin EON17-X have started to be so attractive on the market and among gamers. Moreover, these machines could not be called “desktop replacement” anymore. Finally, products like Origin EON17-X have won their unique place on the market. So, let’s talk about the new Origin EON17-X. This new beast is available at the price of 3.572 dollars, and it comes with all the latest parts inside its 17-inch body. 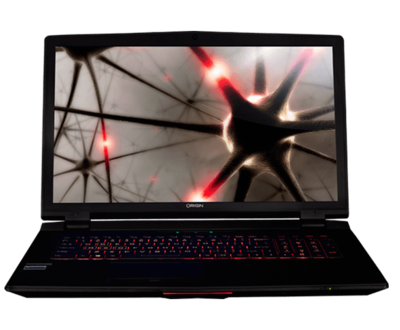 Last year, Origin has released the EON15-X, which has been powered by Devil’s Canyon Core i7-4790K CPU. This year’s model, the EON17-SLX, had both a desktop-class CPU and GPU. But, the new EON17-X comes with a desktop Intel Core i7-6700K Skylake CPU, which is an unlocked part capable of exceeding its 4.2GHz book clock. Moreover, the new Origin EON17-X also comes with Nvidia’s brand-new Pascal-based GeForce GTX 1080. The best part about this GPU is that the mobile parts use the same chip as the desktop version. Why is the new GTX 1080 so special? Because, while the GTX 1060 and GTX 1070 mobile GPUs differ a little bit from their desktop counterparts, Nvidia’s newest GPU mobile part has the exact same specs as the one found on a PC. So, when it comes to CPU and GPU found on the new Origin EON17-X, customers won’t find any difference between the laptop and an overclocked mid-tower desktop. Talking about storage front, the new Origin EON17-X comes with two 256GB Samsung 950 Pro M.2 PCIe-NVMe SSDs in RAID 0 via Intel’s RST software. The display is running an amazing 3860×2160 resolution and measures 17.3-inches. To be added that it is also has a G-Sync panel with a refresh rate of 60Hz. As for the ports, the new Origin EON17-X is fully loaded. So, customers will get two USB 3.1 Type C, a gigabit Ethernet, four USB 3.0 Type A, an SD card reader, two Mini DisplayPort, a lock slot, and audio inputs and outputs. Moreover, the new machine also supports dual-band 801.11ac Wi-Fi and Bluetooth 4.1. The audio part also deserves mention. The new Origin EON17-X comes with plenty of volume to match its huge size. This machine provides quite a bit of bass and users can actually feel it.